Please read the important messages below, then click the "pay and enroll" button at the bottom of the page to continue. Notice to All CDL Holders! If you currently hold a Commercial Driver's License, Class A, B, or C, or if you held CDL when the citation was issued, traffic school cannot be used to mask a driving offense per Tennessee Code Annotated §55-10-301(c); Code of Federal Regulations 49 C.F.R. §384.226. This means that State and Federal law mandate that, all traffic violations received by holders of a Commercial Drivers License, with the exception of a parking ticket, must be reported to the State Department of Safety, without exception. A convenience fee will be added to all credit and debit card transactions processed via telephone, mail or internet. The convenience fee is assessed by the electronic processing company and no part of the fee goes to Metro. When completing your online enrollment, you will be shown the amount due, including the convenience fee, before you select to charge your credit card. You may also pay the class fee in person at the Traffic School Office with cash, check, Visa, Master Card credit or debit cards. For Davidson County tickets, you must pay the clerk's fee at the Traffic Violations Bureau. Click here for more information. To enroll online via the button below, you must have a valid e-mail address. Online enrollment can be completed for Metro Nashville Davidson County citations only. When you enroll for a live class, you will be able to select a class date and time from a pre-set class schedule. You must attend class on the date/time you select. You may not reschedule traffic class unless you can provide documented proof of an emergency or catastrophic event. All classes must be completed by the compliance date to prevent automated state notification of non-compliance. If you do not attend class after you have registered, the school fee is non-refundable. When you enroll for an online class, you will receive a custom login ID (PIN), password, and the link to the school website where you will complete the class. You have only 30 days from the date of enrollment to complete the online course and test at the end of the course. If you do not pass the test or complete the course within the time limit, you will not be able to retake the class, you will not be given a refund of the class fee, and your driver license may be suspended. Questions? 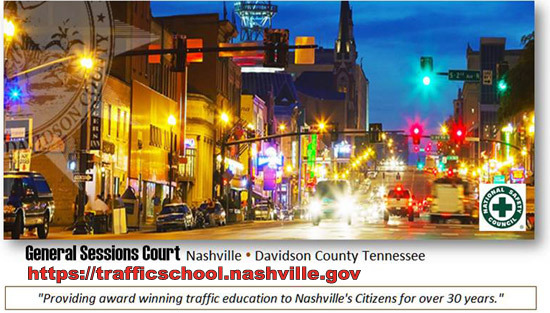 Call the Traffic School business office at 615-862-8345, or come by A.A. Birch Justice Complex, 408 2nd Av. North, Suite 1170. We currently support Internet Explorer 6.0 and higher for Windows operating systems. Other browsers may work, but we do not support them. Users may wish to keep web browsing software current by downloading patches and upgrades as necessary. Please note that on-line courses are only available for persons who qualify for First Offender Training or Defensive Driving, 4 hour classes. All other applicants must take the course by live class. If you have had a course previously scheduled and were absent from class you are not eligible for an online class. Ready to pay and enroll? Ready to take the class online? You must disable pop-up blockers for the application to work properly!